Harbour Place is a low-density complex with only 65 units in Orange Beach, AL very family friendly. The complex has both covered and uncovered parking along with a heated indoor-outdoor swim through pool and an indoor hot tub facing the beach. There is also a shaded deck next to the pool which is perfect for your barbecue or picnic. Harbour Place is DIRECTLY ON THE BEACH, 1/2 mile east of the State Park on the Gulf Shores border. Please contact me with specific questions you might have . Our gorgeous one bedroom, two bath condo is very roomy and has sleeping accommodations for four. We are on the 5th floor and have amazing east views of the Gulf of Mexico. Picture relaxing with your morning coffee as the sun rises and watching the dolphins from your own balcony! We have decorated our condo in bright beachy colors and it has all the comforts of home. The kitchen has granite counters and is fully equipped, containing everything you could possibly need on vacation. 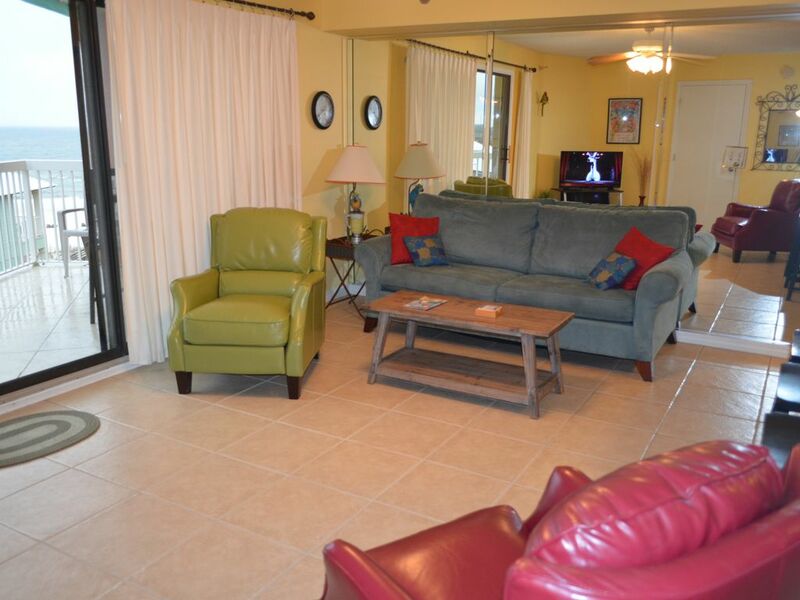 Enjoy the comfortable living area which boasts a fabulous view of the gulf, a recliner and a queen sleeper sofa. A master suite with a king bed, large bath and spacious closet adds to the relaxed feel. The second bath is located off the living area with a tiled shower and tile floors are throughout, including the balcony, which has a view of the gulf. A stack washer/dryer add to the amenities. Harbour Place is in close proximity to attractions, restaurants, shopping, golf and amusement parks. All Orange Beach marinas and marina restaurants are nearby along with the Cotton Bayou, which includes a public boat launch, just within two miles. You will fall in love with this beautiful condo and all our complex has to offer. Come visit HARBOUR PLACE 501 and I am sure you will return year after year. * YOU MUST BE THE AGE OF 25 OR OLDER TO RENT. * MAXIMUM OCCUPANCY IS FOUR (4). I have thoroughly enjoyed my condo since 2010 and you may contact me at anytime regarding specific questions you might have. Condo is awesome. Very clean. Well stocked kitchen. The extra bathroom is a bonus. Nice view of beach. Trisha is wonderful to work with! Would definitely recommend this condo and will return for another stay! We were so happy and impressed with 501 that we now want to buy our own! Trish was so nice and helpful. The unit was so cozy and the bed was very comfortable. We hated to leave. Loved it!! The condo was small, but it was all my husband and I needed. We went out every meal, so I can’t speak to the kitchen item availability. I appreciated the rugs by the bed and back door to wipe sandy feet and the beach chairs provided. The bed was comfortable as well. We will definitely stay here again! Thanks so much for the very nice review and please do come back anytime! We love this condo and complex and absolutely love working with Trish. Maintained and the condo was great. Love working with Trish and love Orange Beach.